On the morning of the dreadful incident, I spoke to Roddy as he passed our house. I cannot recall the precise content of our conversation, but I believe he told me that he was on his way to carry out some work on land belonging to Lachlan Mackenzie. He was carrying some tools, which I took to be for this purpose. In addition, we exchanged some remarks about the weather, it being a fine and sunny morning. Roderick appeared quite composed and betrayed no sign of fretfulness. Sometime later, I saw Roddy make his way back along the village. He was covered from head to foot in blood and I ran from the threshold of my house, thinking that some accident had befallen him. As I approached, he stopped and the tool he was carrying dropped from his hand. I asked what had happened and he replied without hesitation that he had killed Lachlan Broad. He appeared quite lucid and made no attempt to continue along the road. I called to my eldest daughter to fetch her father, who was working in the outbuilding behind our house. On seeing Roddy covered in blood, she screamed, and this brought other residents of the village to their doors and caused those at work on their crops to look up from their labour. There was very quickly a general commotion. I confess that in these moments my first instinct was to protect Roddy from the kinsmen of Lachlan Mackenzie. For this reason, when my husband arrived at the scene, I asked him to take Roddy inside our house without telling him what had occurred. Roddy was seated at our table and calmly repeated what he had done. My husband sent our daughter to fetch our neighbour, Duncan Gregor, to stand guard and then ran to Lachlan Mackenzie’s house, where he discovered the tragic scene. property. I ran back to my own house and took Roddy from there to my outbuilding, where I barricaded him in. He did not resist. Mr Gregor was unable to prevent Lachlan Broad’s kinsmen from entering the premises and seeing the bodies there. By the time I had confined Roddy, they had formed themselves into a vengeful mob, which it took some time and persuasion to subdue. As to the general character of Roderick Macrae, there is no doubt that he was a queer boy, but whether this was by nature or had been brought on by the tribulations which his family has suffered I am not qualified to say. The evidence of his deeds, however, does not speak of a sound mind. I fear the wicked deeds lately committed in this parish only represent a bubbling to the surface of the natural state of savagism of the inhabitants of this place, a savagism that the Church has of late been successful in suppressing. The history of these parts, it has been said, is stained with black and bloody crimes, and its people exhibit a certain wildness and indulgence. Such traits cannot be bred out in a matter of generations, and while the teachings of the Presbytery are a civilising influence, it is inevitable that now and again the old instincts come to the fore. Nonetheless, one cannot fail to be shocked on hearing of acts such as those committed in Culduie. Of all the individuals in this parish, however, one is least surprised to hear that Roderick Macrae is the perpetrator. Although this individual has attended my church since child-hood, I always sensed that my sermons fell on his ears as seeds on stony ground. I must accept that his crimes represent, in some degree, a failure on my part, but sometimes one must sacrifice a lamb for the general good of the flock. There was always a wickedness, easily discernible, about that boy which I regret to say was beyond my reach. The boy’s mother, Una Macrae, was a frivolous and insincere woman. She attended church regularly, but I fear she mistook the Lord’s House for a place of social gathering. I frequently heard her singing on her way to and from the kirk and, after service, she would gather within the grounds with other womenfolk and indulge in intemperate conversation and laughter. On more than one occasion I was obliged to reprimand her. I am compelled, however, to add a word on behalf of Roderick Macrae’s father. John Macrae is among the most devoted to scripture in this parish. His knowledge of the Bible is extensive and he is sincere in his observance. In common with the majority in these parts, however, even while he might parrot the words of the Gospel, I fear his understanding of them is feeble. Following the death of Mr Macrae’s wife, I visited the household frequently to offer support and prayer. I observed at that time many signs about the place of adherence to superstition, such as have no place in the home of a believer. Nevertheless, while we are none of us blameless, I believe John Macrae to be a good and devout man, who did not deserve to be burdened with such noxious progeny. his ability to grasp concepts in science, mathematics and language, and this he achieved without show of effort or, indeed, of any great interest. As to his character, I can offer only the most limited remarks. Certainly, he was not of a sociable nature and did not mix readily with his fellows, who, in turn, regarded him with some suspicion. For his own part, Roderick behaved with disdain towards his classmates, this at times bordering on contempt. Were I to speculate, I would say this attitude was bred by his academic superiority. That said, I always found him to be a courteous and respectful pupil, not given to unruly behaviour. As a mark of my high regard for his academic gifts, when he was sixteen years old, I called on his father to suggest that Roderick should continue his studies and might, in time, amount to something more suited to his abilities than working the land. I regret to say that my proposal received short shrift from his father, who I found to be a reticent and slow-witted individual. I have not seen Roderick since that time. I heard some disturbing rumours about his mistreatment of a sheep under his charge, but I cannot testify as to their veracity, other than to state that I found Roderick to be a gentle lad, not given to the cruel behaviour sometimes found in boys of that age. For this reason I find it difficult to credit that he might be capable of carrying out the crimes with which he has recently been charged. Roderick Macrae is as wicked an individual as one could ever have the misfortune to meet. Even as a small boy there was a mean spirit about him, such as one would not credit in a child. He was for many years thought to be mute and capable only of some uncanny commune with his otherworldly sister, who seemed his partner in wickedness. He was generally regarded in the parish as an imbecile, but I myself reckoned him an altogether more malicious creature, and his recent exploits have borne out this view. From an early age he was given to the spiteful mis-treatment of animals and birds, and to arbitrary acts of destruction around the village. He had the Devil’s own cunning. On one occasion, when he was perhaps twelve years old, a fire was set in the outbuilding of my cousin Aeneas Mackenzie, destroying a number of valuable tools and a quantity of grain. The boy had been seen in the vicinity of the building, but he denied responsibility and the Black Macrae [his father, John Macrae] swore that his son had not been out of his sight at the time in question. He thus escaped punishment, but as with many other incidents, there was no doubt that he was to blame. His father is likewise a feebleminded individual, who conceals his idiocy behind a zealous adherence to scripture and a cringing deference to the minister. I was not present in Culduie on the day of the murders and heard about them only on my return that evening. 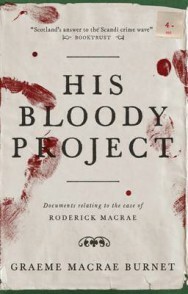 His Bloody Project is the winner of the Saltire Society Book of the Year 2016 and was shortlisted for the 2016 Man Booker Prize. His Bloody Project is out now published by Saraband priced £8.99. Graeme Macrae Burnet will be appearing at various Scottish festivals from June onwards including Skye Book Festival on 31st August and 2nd September and Bloody Scotland in September.